But then they spotted another set of wobbles, and hints of yet another (though they weren’t sure). Now they’ve confirmed a third event, and it made the apes wonder: What does it all mean? And where do we go from here? Today, the pair of Laser Interferometer Gravitational Wave Observatories (LIGO) are confirming the detection of a third set of these gravitational waves, first predicted by Albert Einstein over a hundred years ago. While the third discovery is still almost as exciting as the first and second, scientists are now starting to think about what these waves can tell them about our universe, and what they can do once they’ve seen a lot of them. Scientists have tasked two LIGOs with observing gravitational waves, one in Washington State and the other in Louisiana. They’re essentially a pair of perpendicular rulers made out of light, where optics systems split a laser, send the beams down long pipes, then unite them at a detector. If a gravitational wave rolls by, the amount of space the light has to traverse changes, moving the two beams in and out of alignment and creating a waveform on a graph. 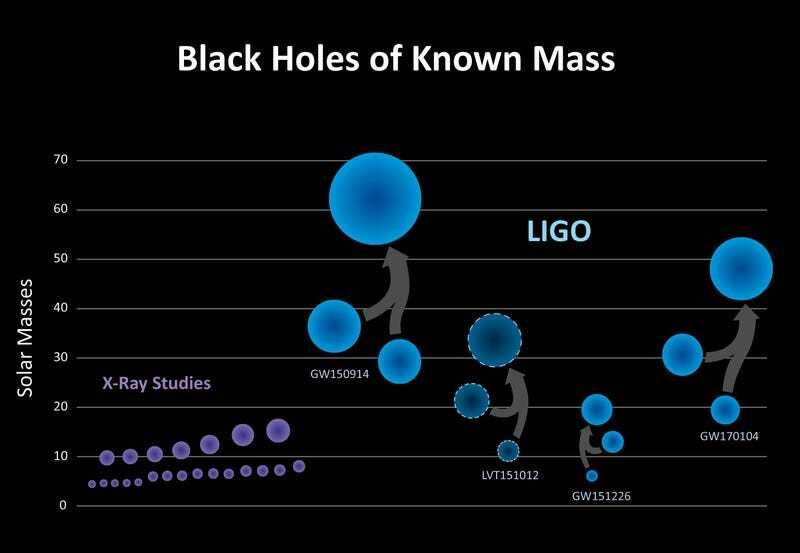 Scientists need two LIGOs to confirm that the observation wasn’t just a truck rolling by. And a similar observatory, called Virgo, is now turned on in Italy and will join the LIGOs soon to better determine the origin and behavior of gravitational waves. 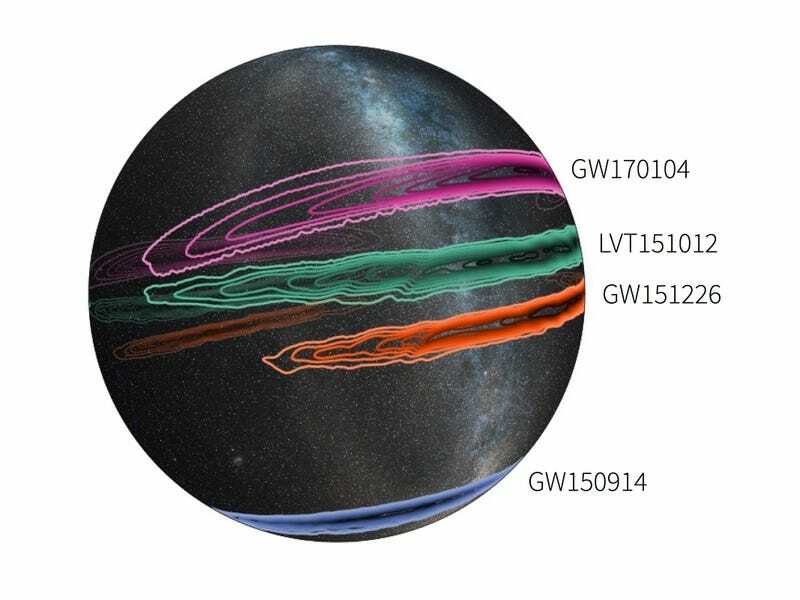 The LIGOs spotted the most the most recent wave event, GW170104, on January 4 of this year. They used the waveform to determine that it came from a pair of colliding black holes three billion lightyears away, approximately 31 and 19 times the mass of our Sun, turning into a single black hole around 49 times the mass, and published their results today in the journal Physical Review Letters. The mass of this black hole fits quite nicely between the mass of the black holes inferred from heavier and lighter waves measured previously. 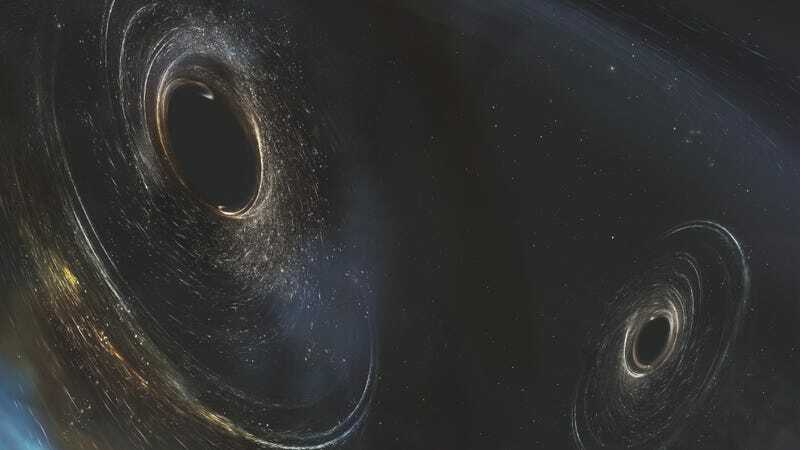 The waveform also supplied some tantalizing hints of an answer to the question of how a pair of black holes end up orbiting each other in the first place. A black hole binary could either form from a pair of orbiting stars that both collapsed, or if one black hole passed by another and got tangled up in its gravity. If the first case were true, the spins of the black holes would align with their orbits. But if the spins were in the opposite direction of the orbits, the second scenario would be more likely. The latest gravitational wave observation is starting to point scientists towards the second case. It’s certainly not conclusive yet, but it implies that in the distant (and therefore younger) universe, there could places concentrated with coalescing black holes, Imre Bartos, associate research scientist from Columbia University, told Gizmodo. “This event is not a smoking gun, but it’s the first event for which we more seriously prefer one scenario over another,” Salvatore Vitale, assistant professor at MIT, told Gizmodo. “If you ask me I think it’s too early to say anything conclusive,” he said. Gravitational wave astronomy is still in its infancy, but we’re soon going to get to a point where each individual detection of waves isn’t news. We’re not there yet, but soon you should expect to start hearing more about what scientists can pick out of trends among lots of colliding black holes, and about follow-up observations from the networks of satellites and telescopes looking for an electromagnetic or neutrino counterpart to the gravitational waves. That is amazing, by the way. Gravitational waves, a prediction made by general relativity dreamed up a hundred years ago to explain strange kinks in the theory of gravity, like the weirdness of Mercury’s orbit, can also describe powerful events taking place on the other end of the universe. “It’s a human being compared to Usain Bolt,” he said. “That same theory without any modifications also explains the motion of objects incredibly massive moving incredibly fast, velocities comparable to the speed of light.” To be fair, it would be very exciting to a lot of people if someone did find a deviation from Einstein’s theory. Further down the road after Virgo is hooked up, other detectors, including one in India and another in Japan, will help pinpoint the location of gravitational waves—right now, there’s a huge swath of the sky from which they can originate. Eventually, scientists will also be able to determine the waves’ polarization, the way they actually deform space as they travel. June 4, 2017 mannaismayaadventurePhysicists Just Spotted Gravitational Waves Again—So What's Next?